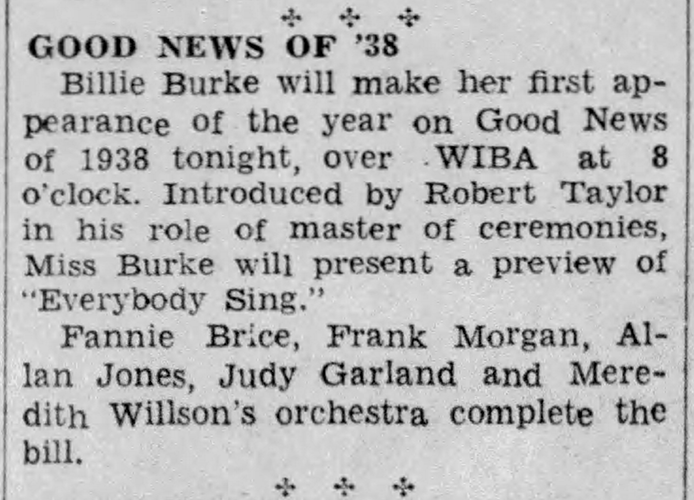 February 3, 1938: Judy appeared with her Everybody Sing costars Billie Burke, Allan Jones and Fanny Brice on the “Good News of 1938” radio show broadcast by NBC Radio. Judy and Fanny performed “Why? 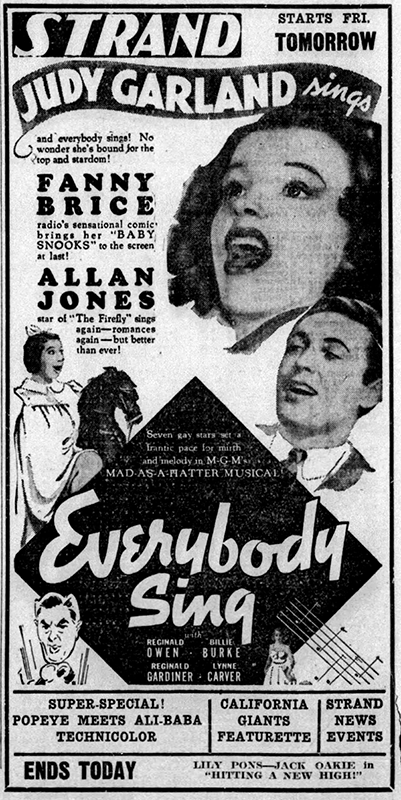 Because!” from the film as part of a preview provided by the cast. 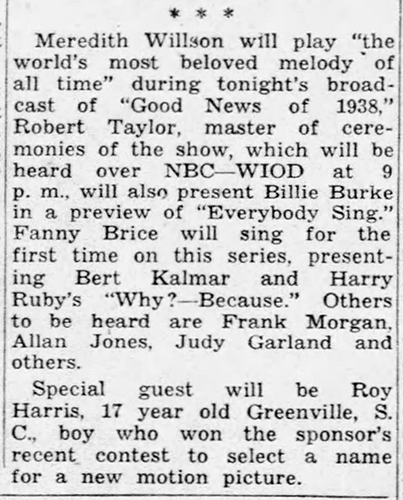 Also on the show was Frank Morgan as well as MGM star Robert Taylor who was this show’s emcee. 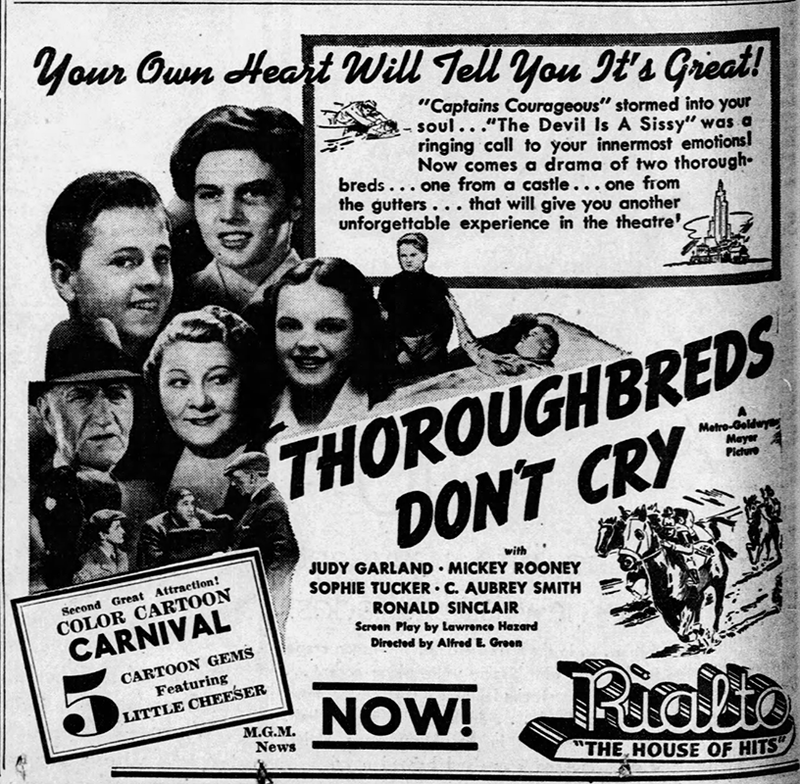 February 3, 1938: Two Judy Garland films were currently in circulation, Thoroughbreds Don’t Cry (released in 1937) and the recently released Everybody Sing. Judy’s star was on the ascendant. 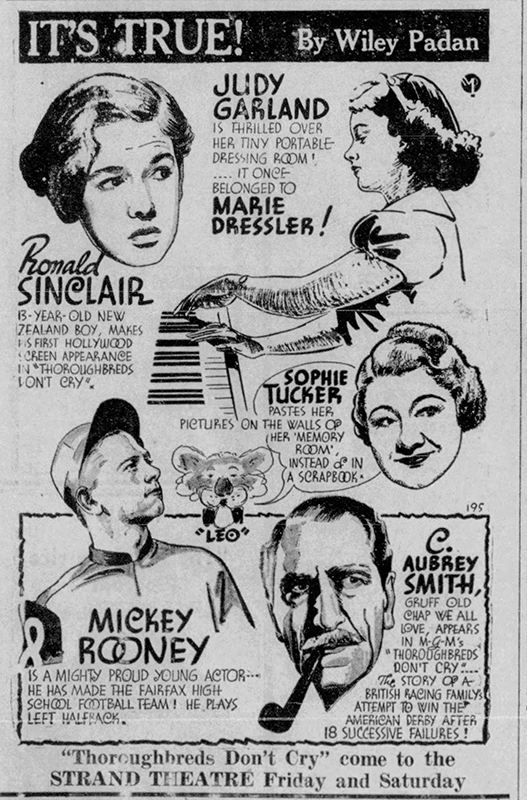 February 3, 1938, & 1939: Two examples, a year apart, of MGM marketing Judy as the height of teen fashion. 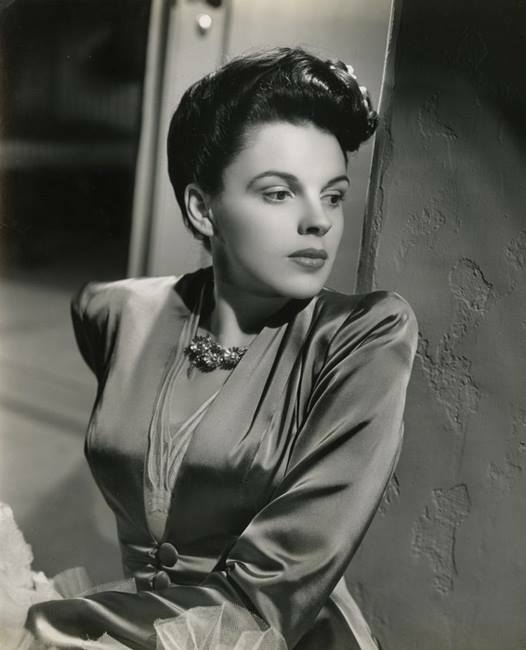 The photo from 1938 was taken in Miami, Florida, during Judy’s recent personal appearance there for the world premiere of Everybody Sing. 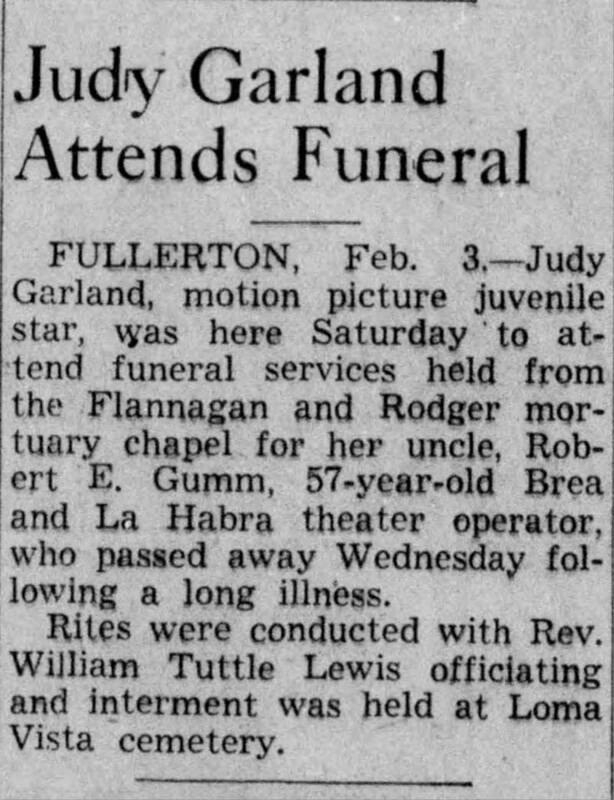 February 3, 1941: Apparently Judy’s uncle was a theater owner like her father. It’s nice that she was able to attend the funeral. 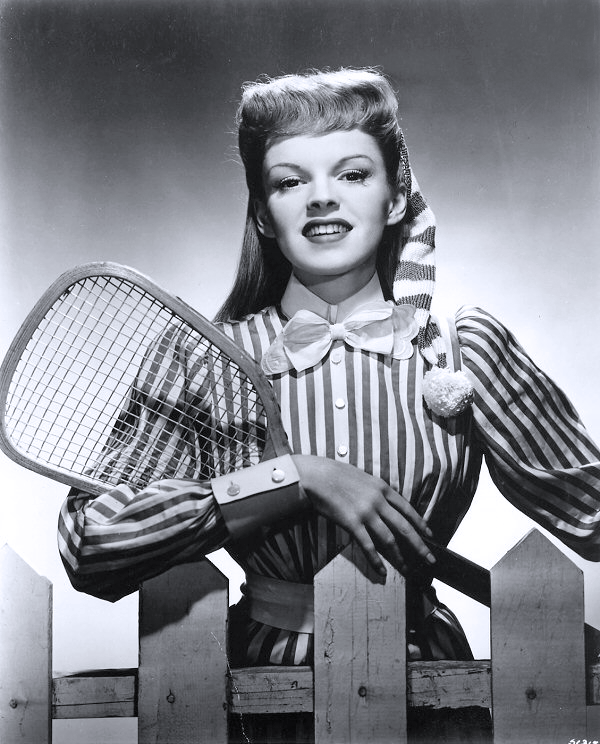 February 3, 1944: Judy had a short day at MGM. 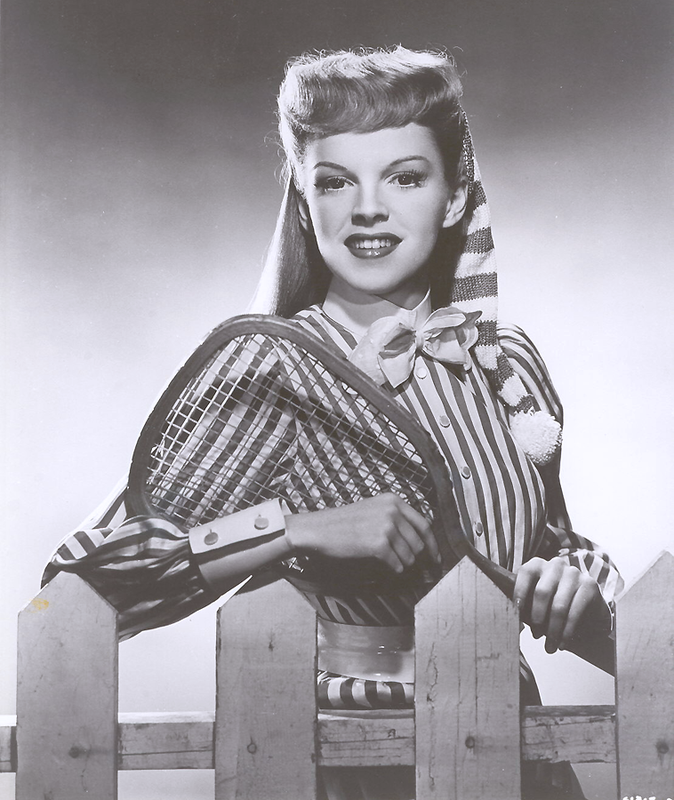 From 2:00 to 3:00 p.m. she was recording “synch loops” (dubbing) for Meet Me In St. Louis. 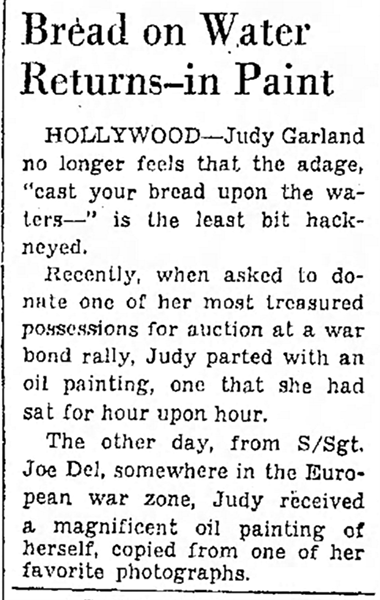 February 3, 1945: One wonders, if this story is true, just what happened to the paintings of Judy. February 3, 1947: Makeup and costume tests for The Pirate including the “Voodoo” costume. 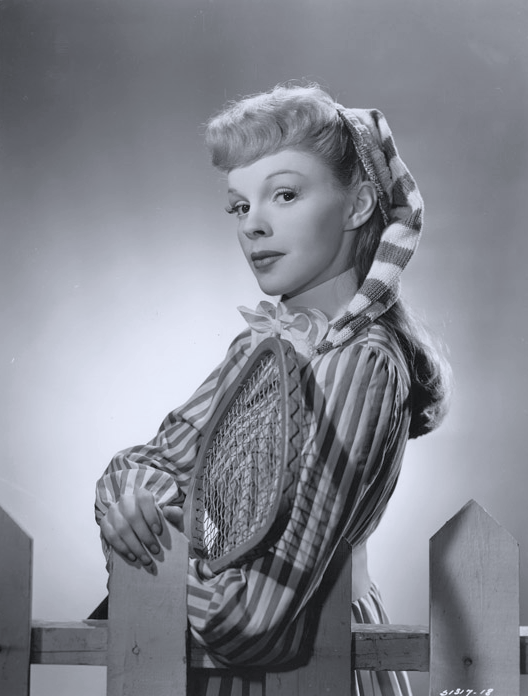 Time called: 1 p.m.; dismissed: 5:20 p.m.
Also on this day, Judy signed an agreement on MGM/Loew’s stationery to appear on a Bing Crosby radio show, saying that she would be paid by Bing Crosby Enterprises. 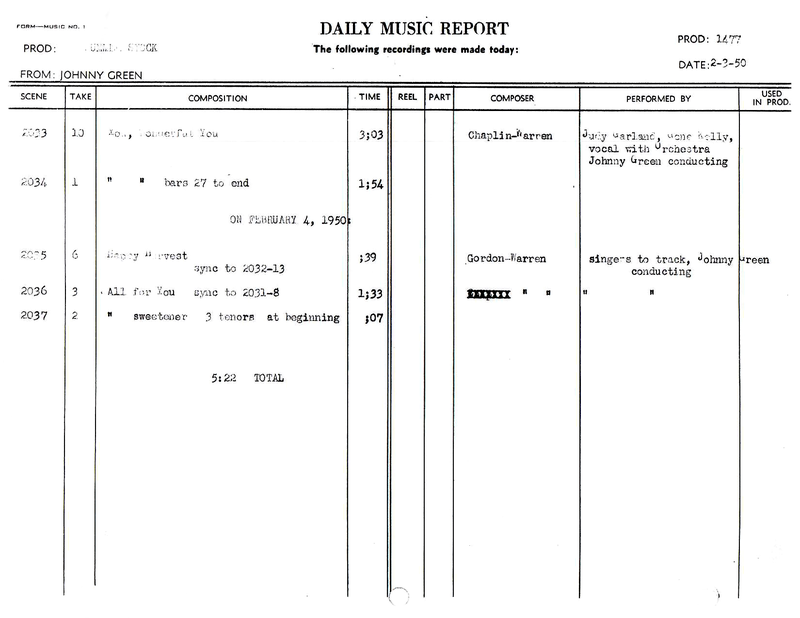 The radio show was recorded the following day. 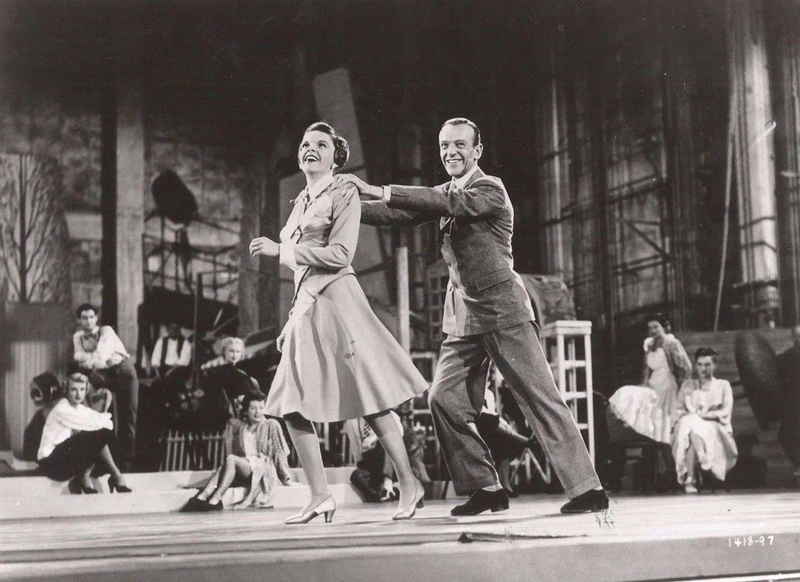 February 3, 1948: Judy had more “synch to loops” (dubbing) work for Easter Parade. She arrived at 2:00 p.m. and was dismissed at 3:40 p.m.
February 3, 1954: A Star Is Born filming consisted of scenes on the “Exterior Beach House” set, which was location shooting at Laguna Beach, California. The scenes were of Judy (Vicki Lester) and James Mason (Norman Maine) looking at the beachfront property where their new home was going to be built. 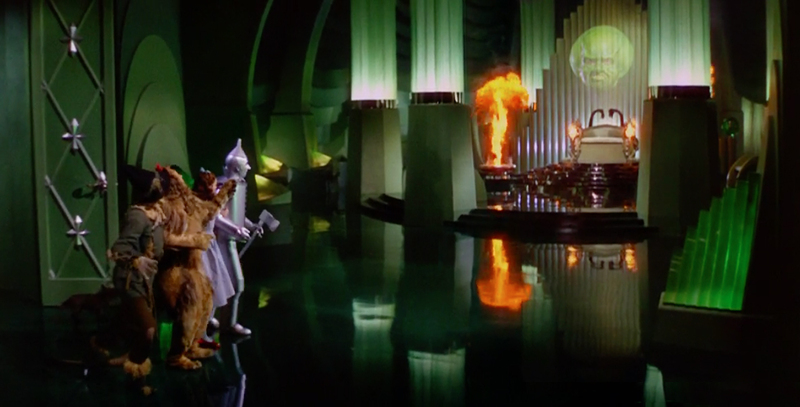 They have a picnic on the beach and Judy sang a reprise of “It’s A New World.” The scenes were cut from the film after the previews but before the premiere. 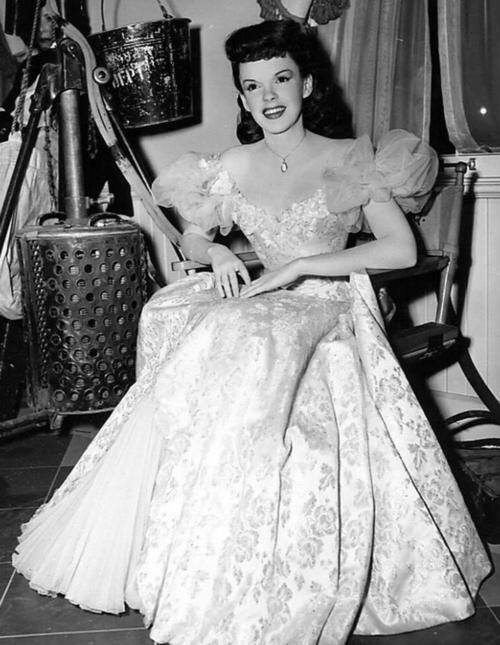 Filming started at 10 a.m. and finished at 3:30 p.m.
February 3, 1956: Judy filed suit for divorce from Sid Luft for the first time. 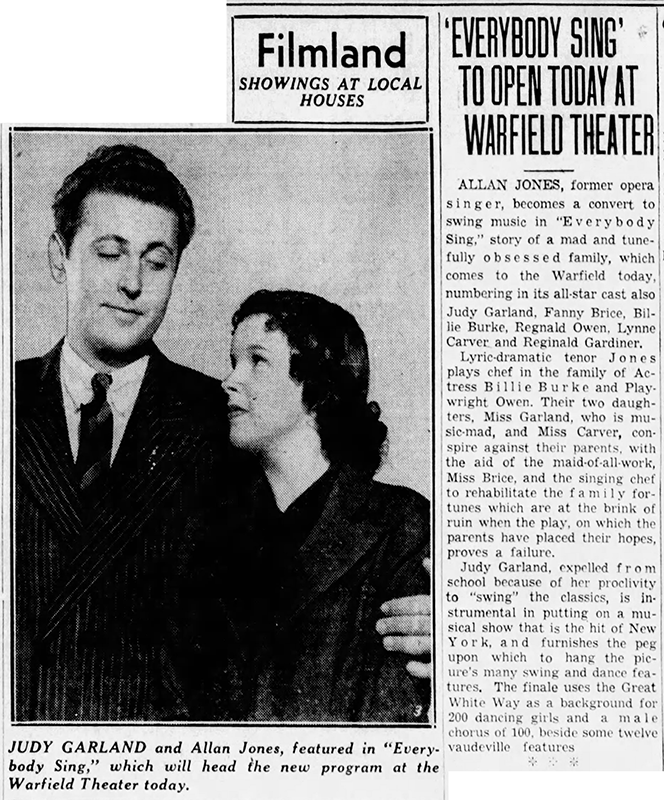 The couple’s marital problems played out in the newspapers the following day. February 3, 1962: Columnist Bob Thomas wrote about the Garland renaissance. 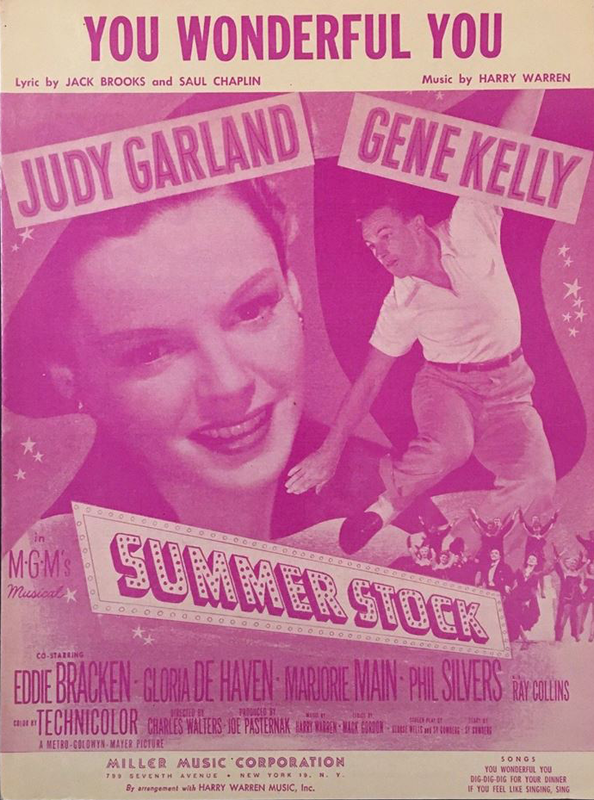 Judy’s career was on an upswing thanks to “Judy at Carnegie Hall” and her latest film, A Child Is Waiting in which she gives a nuanced dramatic performance. 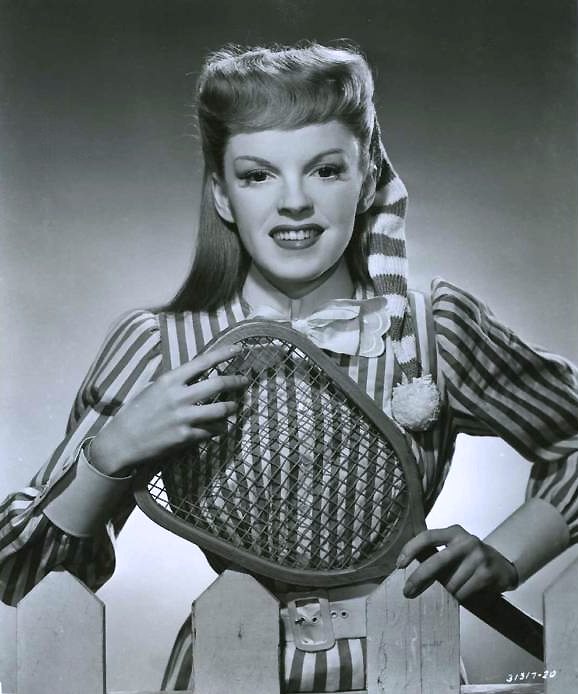 Thomas predicted that Judy would receive an Oscar nomination but that didn’t happen. 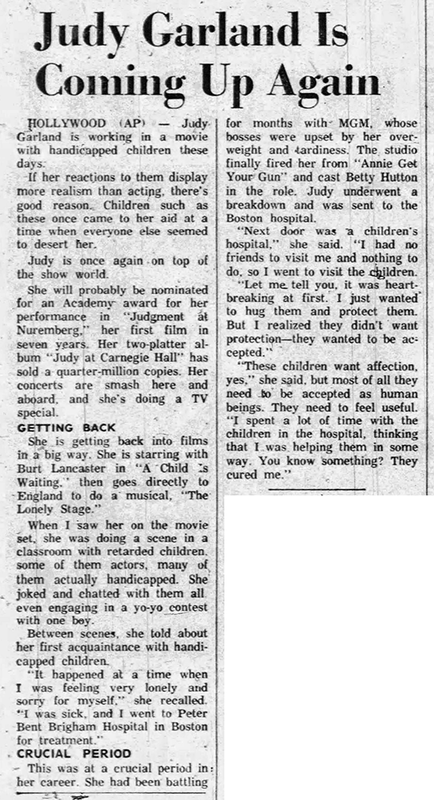 In the article, Judy told the story about how the handicapped children at the Peter Bent Brigham Hospital in Boston, Massachusetts, helped her in her time of need in 1949. February 3, 1966: Judy’s ex-husband, Sid Luft, sues Jack Warner. I don’t know what the outcome was. Probably nothing.